Whether your laminate flooring is Pergo, Wilsonart, Alloc, or other brands, the below tips are going to help you to clean and maintain your laminate floor. McCurley’s Floor Center and macfloor offers a wide selection of Laminate Floor cleaning and maintenance supplies from recommended factories in stock. Vacuum the floor using the wand attachment or suction part of the vacuum cleaner to remove loose dirt and dust. Use a dust mop or wipe with a damp cloth for spot cleaning. DO NOT use beater brush type vacuum on your floor to prevent damage and scratches laminate floor. To clean the entire floor use the laminate manufactures recommended cleaner with either a spray mop or a very well squeezed out sponge mop and just spray and clean. DO NOT use soap based detergents or mop & shine products as these may leave a dull film on your floor. Also do not use abrasive cleaners, steel wool or scouring powder which can scratch your floor. Use sensible measures like felt protectors on chair legs and mats next to outside entrances to protect your floors. For tough spots like shoe polish, tar and asphalt driveway sealer use nail polish remover containing acetone ** (Please follow instructions on label). Then wipe with a damp cloth. For Chocolate, grease, juice or wine use warm water and a non-abrasive cleaner. For Candle wax and chewing gum carefully scrape off when hardened. The below Laminate Cleaning Products are what we carry and are available at both of our stores. Pergo Cleaner and Cleaning Kits. 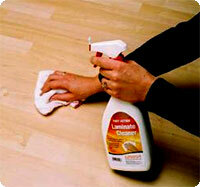 Other Laminate Cleaners also available.